QUEENS — A new entrance to the Briarwood-Van Wyck F train station is scheduled to open this fall, officials said. The opening comes as welcome news for locals who for the past 10 months have used an entrance that is a long walk from the residential part of the neighborhood. The new entrance, which will be located at Queens Boulevard and Main Street — adjacent to the Briarwood branch of the Queens Public Library and one block away from Archbishop Molloy High School — is being built as part of the Kew Gardens Interchange project, which will widen the Van Wyck Expressway and rebuild its bridges and ramps. The previous entrance at the same intersection was closed in 2010. 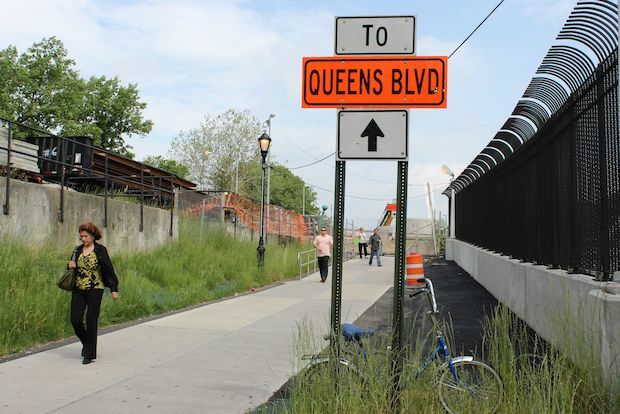 The other Queens Boulevard entrance closed permanently in August last year for the Van Wyck Expressway construction. The new entrance will open this fall according to Adam Levine, a spokesman for the state Department of Transportation. Residents said that walking around the construction site and along Maple Grove Cemetery to get to the current entrance had made their lives difficult. Some residents said that they sometimes prefer to wait for the Q60 bus and take it to the Kew Gardens subway station. “It is a longer walk, and we appreciate everyone’s patience as the work progresses,” Levine said. Seymour Schwartz, president of the Briarwood Community Association, said that once the new entrance opens, it will have been worth the wait. “The corridor has been rebuilt, it has been widened, the number of steps has been slightly reduced and there will be an elevator going down two levels,” he said. The elevator is slated to open next year, according to the state DOT. Rosa Delgado, who was pushing a baby carriage with her grandson, said that an elevator will be an important addition. Schwartz also said the entire neighborhood will benefit from the project. “For the first time we are going to have new traffic lights, we are going to have bridges rebuilt, we are going to have the streets re-paved and there will be a couple of bench areas along the way," he said. "It will clean up the area very much." The Kew Gardens Interchange project began in 2010 and consists of two phases. The phase that includes the Briarwood area is scheduled to be completed by 2016, according to the state DOT website.